Having escaped the overbearing Mama-And-Daddy entity and his annoyingly girly sister Allison, year-old dromaeosaur and new starship captain Nathaniel suddenly finds himself in the middle of a mysterious mission. As his companions fill in the empty gaps in his memory, he realizes that there are far more sinister forces at play in the universe than just meddlesome adults and alien beasts. His speed, agility, and sharp claws may protect him from other animals, but what can protect him from the terror of the fun sponge? This is the first episode in the series based on the childhood memories of Nate in The Spider, The Witch, And The Spaceship. Terror Of The Fun Sponge is 33,404 words. I did my best to capture the spirit of childhood and the fascination of alien biology inside a space travel adventure. ​I wrote Terror Of The Fun Sponge because with all the talk of bullying in recent years it occurred to me that the issues are not always so cut-and-dried as people imagine. We cannot always agree on who is bully and who is victim. I’ve been bullied, but I have also been accused of bullying for nothing more than raising my voice to people who were annoying (and sometimes bullying) me. One of the most common yet least reported ways to bully people is to accuse them of being bullies. I’ve noticed especially in the political realm, people are prone to become bullies themselves in their anti-bullying zealotry. We have this potential inside all of us. In Terror Of The Fun Sponge, Nathaniel is first bullied and then becomes labeled a bully himself. ​“Give us the candy, fur-face,” a large Hooshbug commands. Three others suddenly surround the boys. For a second before Nathaniel responds, Haticat is not sure who they are speaking to, as frosting is rarely called candy, and Nathaniel is feathered, not furry. “Huh?” Nathaniel says. “We’re not going to ask nicely again, shaggy. Hand it over,” the large Hooshbug says. “I don’t have fur; I have feathers. I’m a theropod, not a synapsid,” Nathaniel says. “Fur, feathers, scales, whatever. All you vertebrates and Gruezhlings look like you’re flaking apart on the outside. You’re so ugly,” the Hooshbug says. The other three snicker. “Sticks and stones may break my…Hey!” Nathaniel starts, but is interrupted when the nearest Hooshbug snatches the tub of frosting from him in his complexly folding mouthparts and runs. The others follow. “You are!” Nathaniel yells back up at them. “You’re ugly and disgusting,” the lead Hooshbug calls back. “You walk wrong and you smell funny,” Nathaniel yells. “You walk without shoes,” the Hooshbug says. “Bricks and cones pay snake my phones! You’re an idiot.” The Hooshbugs laugh and shut the window. “The chant doesn’t work on these bullies. What do we do?” Haticat asks. “I don’t know,” Nathaniel says. He feels hurt, helpless, and still hungry. He can’t take much more abuse. These words really did hurt. Scared of what else might be coming, he retreats. The Hooshbugs had won in making him give up the chase. “Maybe we need practice mocking and using comebacks. Let’s try to think of some and write them down,” Haticat suggests. “Yeah, that’s a good idea,” Nathaniel says. The boys walk back to the dancefest, but soon lose interest and instead sit with a pen and notebook trying to think of comebacks. “Let’s think of some mocking. If someone calls us ornithopods, we can say we’re hornithopods,” Nathaniel says. “I don’t think that will work,” Haticat says. “We need to copy the whole sentence so they will know we are mocking them. You need to call them a hornithopod,” Haticat explains. “Oh, that’s a better idea! I like it,” Nathaniel says. “We can also say blah blah blah after every time they talk,” Haticat says. “If someone calls us stupid and ugly, we can say they are stilted and igloo,” Haticat says. “Good, good. Keep thinking,” Nathaniel says. “If someone calls us crazy, we can say you’re welcome. That’s a comeback,” Haticat says. “Oh, I’ll make a separate page for comebacks,” Nathaniel says, flipping through his notebook for a blank page. He is momentarily distracted by his own previous notes of all the animals he’s read about. Bees can see ultraviolet light. “If someone calls us a vegetable face, we can call them vegetable paste,” Haticat says. “Is that a comeback or a mock?” Nathaniel asks. “Uh…I’m not sure,” Haticat replies. “I’ll need a third page,” Nathaniel mutters, flipping pages. There are so many orders of insects. Some beetles have horns. “If instead someone calls us vegetable paste, we can call them poop paste,” Haticat says. “Poop paste? I like it. That will make them cry and give up,” Nathaniel says, giggling with glee. “If someone says we smell bad, we can say we agree that we smell them – we make them call themselves bad,” Haticat says. “Slow down; I can’t write that fast,” Nathaniel says. “This will be the best list ever. We’ll be unbulliable!” Haticat exclaims. “Did you know that insects breathe through their sides?” Nathaniel asks, no longer listening. 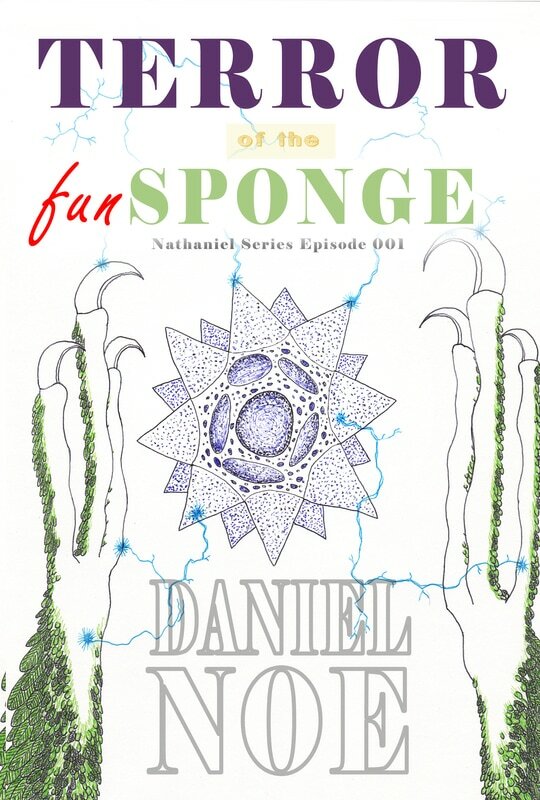 The cover depicts Nathaniel’s hands as he reaches for a fun sponge and it begins to draw energy from him.